Orchestra 2001 is a collective of adventurous, virtuoso performers dedicated to the music of our time. The ensemble strives to be an international leader in connecting diverse audiences with the greatest music of the 20th and 21st centuries, engaging new listeners through exhilarating concerts, innovative artistic collaborations, and enriching community partnerships. 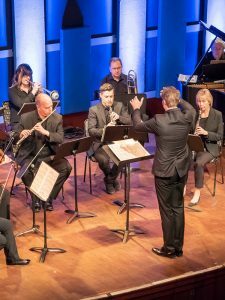 They have presented programs with 1 to 80 performers at the Kimmel Center, Barnes Foundation, World Cafe, The Fillmore, and multiple other indoor and outdoor venues. As recipient of four NEA touring grants, Orchestra 2001 has performed for diverse audiences in rural Appalachia, the Southwest’s Navajo Nation, and is preparing for an upcoming tour to historically black colleges in Alabama, Louisiana, and Mississippi. They have also toured internationally through Asia, Europe, Cuba, and the Middle East. At Cherry Street Pier, Orchestra 2001 will present informal concerts, educational activities, and a “Composer At Work” window, featuring the work of local composers and performers.